Using a screwdriver, remove the no. 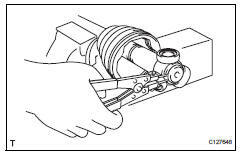 2 Inboard joint boot clamp, as shown in the illustration. Using needle-nose pliers, remove the no. 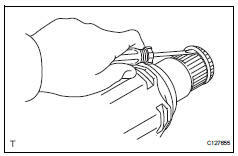 2 Inboard joint boot clamp, as shown in the illustration. Remove front axle inboard joint boot no. 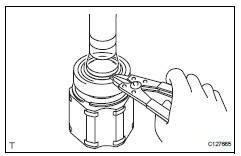 Using a screwdriver, remove the inboard joint boot clamp, as shown in the illustration. 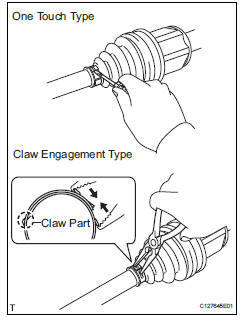 Using needle-nose pliers, remove the inboard joint boot clamp, as shown in the illustration. Remove the boot from the inboard joint. Remove any old grease from the inboard joint. 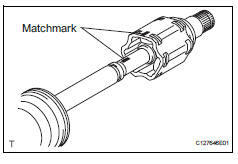 Put matchmarks on the inboard joint and outboard joint shaft. Do not punch the marks. Remove the inboard joint from the outboard joint shaft. Using a snap ring expander, remove the shaft snap ring. Put matchmarks on the outboard joint shaft and tripod joint. Using a brass bar and hammer, tap out the tripod joint from the outboard joint shaft. Remove the inboard joint boot. 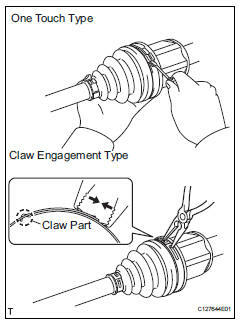 Using a screwdriver, remove the drive shaft damper clamp, as shown in the illustration. 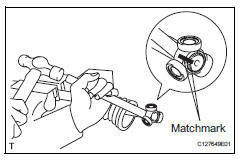 Using needle-nose pliers, remove the drive shaft damper clamp, as shown in the illustration. Remove the front drive shaft damper. Using a screwdriver, remove the no. 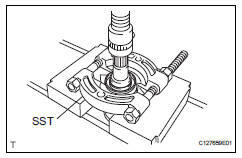 2 Outboard joint boot clamp, as shown in the illustration. 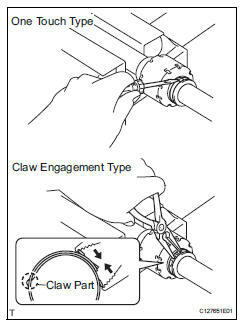 Using a screwdriver, remove the outboard joint boot clamp, as shown in the illustration. 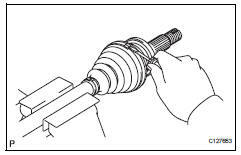 Remove the outboard joint boot from the outboard joint shaft. Remove any old grease from the outboard joint. Using a screwdriver, remove the hole snap ring. 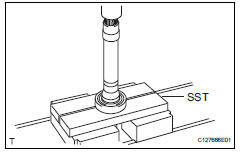 Using sst and a press, press out the front drive shaft dust cover. Using a press, press out the drive shaft dust cover. Using a snap ring expander, remove the drive shaft hole snap ring. Using sst and a press, press out the drive shaft bearing.